Can you still remember your high school mathematics? We are sure you have learned the famous Sine Rule. 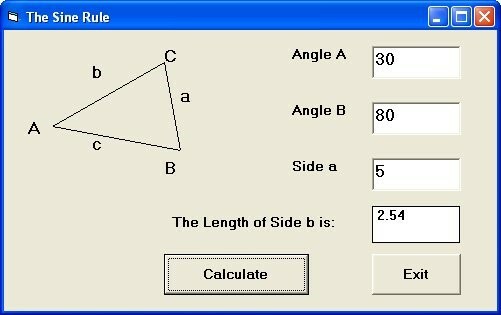 Using the Sine Rule, you can calculate angles and any side of the triangle if you are given enough data. The sine rule is shown in the diagram below. For example, if the user enters angle A and angle B as 60 and 30 respectively, and the length a=4,b=6.93, you can calculate c. You need to convert the degree to radian by multiplying the angle by pi(=3.14159) and divide it by 180.